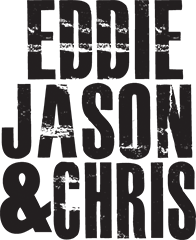 This week on Eddie Jason & Chris, David Boyd, singer of alternative powerhouse New Politics, talks about the band’s new record Lost in Translation. Plus, up-and-coming pop-punkers, One for the Braves, premiere a new song. Out of upstate New York, One For The Braves delivers a high-tempo, throwback pop-punk sound that idobi loves. Listen in as the guys premiere their new song “Dirt Nap” and chat with EJC about the beginning stages of their careers. Next, New Politics have released a melodic new song “Color Green,” from the forthcoming album Lost In Translation, due out on October 6 via DCD2/Warner Bros. Find out why this is singer David Boyd’s favorite song he’s ever written, and more tons more. Also, Chris is a sad sack, who said the quote: Eddie, Jason, or Chris, Chris loses his fiancee’s wedding ring, questionable parenting choices and more.